Rumpelstiltskin, Germany (Grimm) - andrea-hofmann308s Webseite! But all at once the door opened, and in came a little man, and said, good evening, mistress miller, why are you crying so. Alas, answered the girl, I have to spin straw into gold, and I do not know how to do it. What will you give me, said the manikin, if I do it for you? My necklace, said the girl. The little man took the necklace, seated himself in front of the wheel, and whirr, whirr, whirr, three turns, and the reel was full, then he put another on, and whirr, whirr, whirr, three times round, and the second was full too. And so it went on until the morning, when all the straw was spun, and all the reels were full of gold. By daybreak the king was already there, and when he saw the gold he was astonished and delighted, but his heart became only more greedy. He had the miller's daughter taken into another room full of straw, which was much larger, and commanded her to spin that also in one night if she valued her life. The girl knew not how to help herself, and was crying, when the door opened again, and the little man appeared, and said, what will you give me if I spin that straw into gold for you. The ring on my finger, answered the girl. 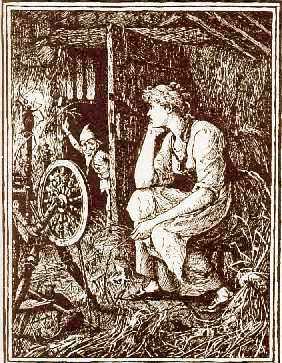 The little man took the ring, again began to turn the wheel, and by morning had spun all the straw into glittering gold. The king rejoiced beyond measure at the sight, but still he had not gold enough, and he had the miller's daughter taken into a still larger room full of straw, and said, you must spin this, too, in the course of this night, but if you succeed, you shall be my wife. Even if she be a miller's daughter, thought he, I could not find a richer wife in the whole world. And when the king came in the morning, and found all as he had wished, he took her in marriage, and the pretty miller's daughter became a queen. A year after, she brought a beautiful child into the world, and she never gave a thought to the manikin. But suddenly he came into her room, and said, now give me what you promised. The queen was horror-struck, and offered the manikin all the riches of the kingdom if he would leave her the child. But the manikin said, no, something alive is dearer to me than all the treasures in the world. Then the queen began to lament and cry, so that the manikin pitied her. I will give you three days, time, said he, if by that time you find out my name, then shall you keep your child. So the queen thought the whole night of all the names that she had ever heard, and she sent a messenger over the country to inquire, far and wide, for any other names that there might be. When the manikin came the next day, she began with caspar, melchior, balthazar, and said all the names she knew, one after another, but to every one the little man said, that is not my name. On the second day she had inquiries made in the neighborhood as to the names of the people there, and she repeated to the manikin the most uncommon and curious. Perhaps your name is shortribs, or sheepshanks, or laceleg, but he always answered, that is not my name. Is your name Conrad? No. Is your name Harry? No. Perhaps your name is Rumpelstiltskin?